or that special trout hole eighty feet below the surface, trophy fish are everywhere. People may not believe their ears when you tell them. Luckily, you’ll have the pictures to prove it. perfect retreat after a day’s excitement on the water. for the ultimate adventure seeker. as they do in finding just the right fishing holes. 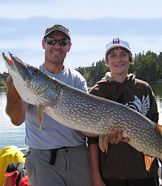 Kississing provides outstanding fishing for northern pike, walleye and lake trout. It’s not uncommon for one person to catch 100 fish a day! Experience 5-star service like never before! 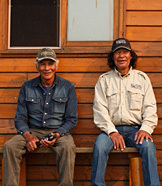 You’ll notice the extra care we take to ensure every detail of your trip is carefully tailored and executed. 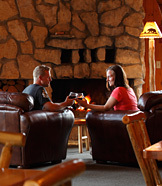 From the main lodge, centered by a massive 26’ fireplace, to your private cabin with cozy down duvets, you’ll truly feel right at home. 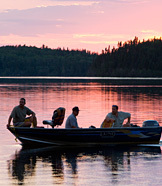 Your GPS can’t tell you the location of the best fishing spots, but your guide can. They know the patterns of the fish for every season and weather condition. There are few places in the world where you can fish long after dinner is done, guided by the comforting light of the sun. Kississing is one of them.